January 17, 2018 By This post may contain affiliate links. 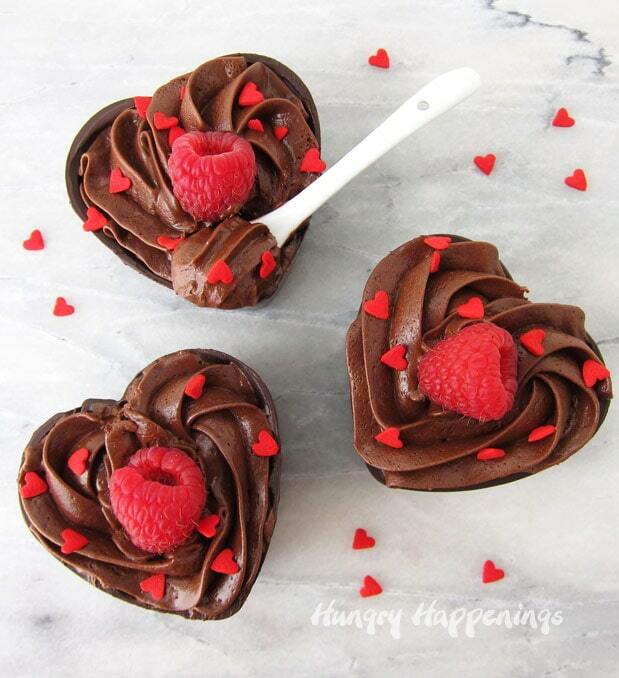 Nothing makes a Valentine’s Day dinner sweeter than a decadent dessert like these Chocolate Mousse Cup Hearts. Each dark chocolate heart cup is filled with the very best chocolate mousse and is topped with a vibrantly fresh raspberry and some red heart sprinkles. 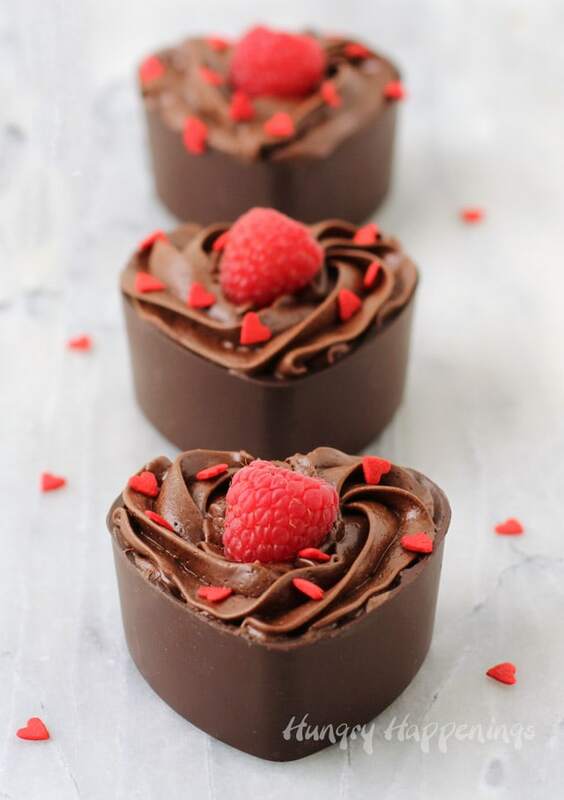 If you serve these amazing Chocolate Mousse Cup Hearts this Valentine’s Day, I just know you will win the heart of anyone who tastes them. For years I have been making my favorite chocolate mousse recipe for friends and family and I am constantly being told it’s the best chocolate mousse ever! Chocolate lovers have often said it’s the best dessert they’ve ever eaten. I first learned how to make chocolate mousse at a chocolate making class taught by a local chocolatier almost 20 years ago. He first showed us how to make a simple mousse using just chocolate and cream. It was good but when he then demonstrated making another mousse using the addition of simple syrup and egg yolks. I about fell out of my chair after my first taste. I had never enjoyed a chocolate dessert that was so amazingly creamy, full of flavor, and incredibly chocolatey. 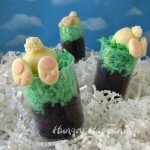 Over the years I’ve used the mousse to make my Chocolate Raspberry Mousse Cake, a Three Layer Chocolate Cherry Mousse Cake, and even a gluten free Chocolate Peppermint Mousse cake, and for parties and special occasions like Valentine’s Day, I like to serve the chocolate mousse in handmade chocolate bowls or cups. 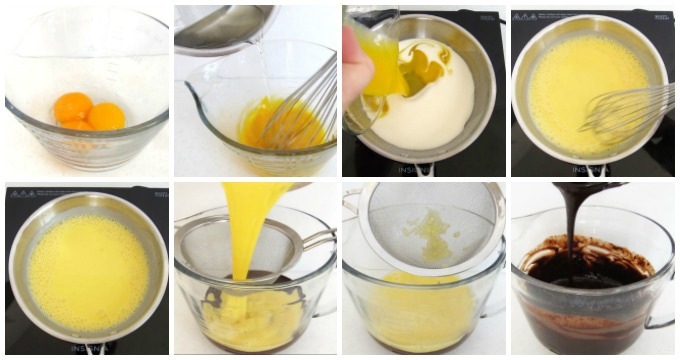 The original mousse recipe calls for boiling water and sugar together to make a simple syrup then pouring that boiling liquid into egg yolks. The process of this helps to heat the eggs so that they are safe to eat. I’ve made this recipe dozens of times and served it to hundreds of people and have never had any issues with it as it is, however several of my readers have expressed concerns about the eggs in the recipe. start by using pasteurized eggs. 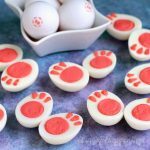 Pasteurized eggs have been gently heated in their shells, just long enough to kill any bacteria but not long enough to actually cook the eggs, making them safe to use in recipes that call for uncooked or partially cooked eggs. You can buy Safest Choice Pasteurized Eggs at some grocery stores or you can pasteurize them yourself. or you can heat the eggs used in this recipe for a longer time. To do so, combine some of the whipping cream, called for in my original recipe, with the egg yolk/sugar syrup mixture and heat it on the stove top for at least 3 minutes or until thickened. You need the temperature to get to between 140 and 160 degrees F.
I’ve done both. I actually like the second method for two reasons. I don’t have to go to my specialty grocery store to buy the pasteurized eggs. Once heated through the cream/egg yolk/simple syrup is mixed with melted chocolate and it blends together beautifully. On occasion while using the original recipe the chocolate has gotten extremely thick once the egg/syrup mixture was added and I had to microwave it to thin it out. This new method works perfectly every time. Just note that the mousse will be rather thin once the whipped cream is folded in and it will need to be chilled in the refrigerator for a few hours in order to firm up enough to be piped. If using the mousse in a layered cake you can pour it into the pan then chill it. You seriously cannot go wrong by using this new chocolate mousse recipe. Well, that is as long as you use your absolute favorite chocolate. Do not skimp here. Don’t use cheap chocolate chips, or bland tasting dark chocolate. Grab the best tasting chocolate to make your mousse. I personally use Peter’s Burgundy Chocolate which is a semi-sweet chocolate with delicately sweet flavor with undertones of a fruity wine. I use to make all my chocolates and I buy 50 pound cases of it from a wholesaler. You can buy 10 pound blocks of it from amazon Peter’s Burgundy Chocolate and you can often find even smaller quantities at cake and candy decorating shops. I also love using Callebaut chocolates and depending on your preference (for bitter or sweet) any of their blends make fantastic mousse. I personally would choose something with a lower cocoa percentage because I like my chocolate a bit sweeter, but you might prefer something more robust so go with a higher cocoa percentage. Ghirardelli is also a nice choice and it readily available in most grocery stores. To make this mousse special for Valentine’s Day I decided to serve it in chocolate heart bowls. 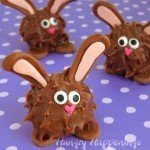 I used melted and tempered chocolate to make them but you can use confectionery coating/candy melts if it’s easier. 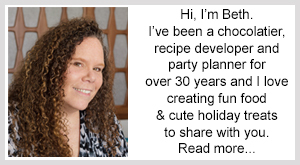 You can read my chocolate making tips page for detailed instructions on working with the different types of chocolate. 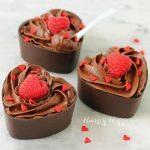 This mousse recipe will fill 8-12 of these chocolate heart bowls, depending on how full you make them, each made using a Wilton Silicone Heart Mold. 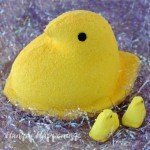 Each heart is approximately 2 1/2 inches in diameter and 1 1/4 inches tall. Once filled with chocolate mousse they make perfectly sized individual desserts. 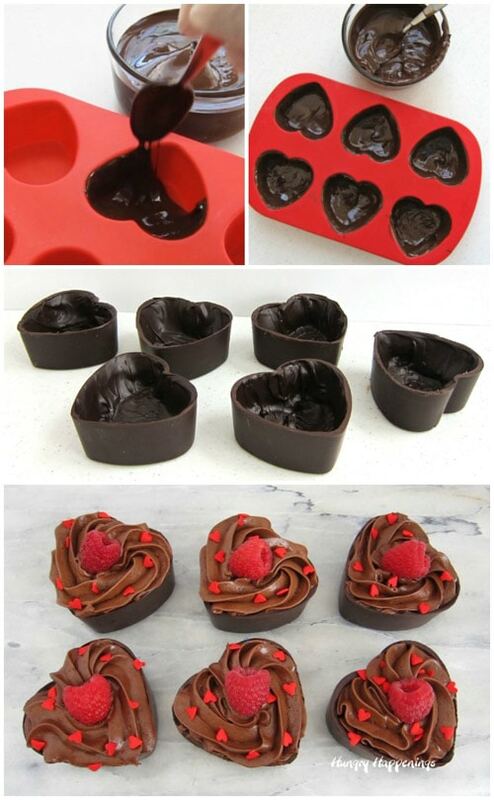 Chocolate heart shaped bowls filled with luxuriously smooth chocolate mousse. Spoon about an ounce of chocolate into one heart shaped cavity in your silicone mold. Brush the chocolate up the sides of the mold adding more chocolate as needed to create a nice shell. Let the chocolate set slightly then add a second layer. You will use approximately 2 ounces of chocolate per heart shaped bowl. Repeat creating 12 heart bowls. Refrigerate until completely set then remove and un-mold. Spoon mousse into a pastry bag fitted with a large star tip. Pipe into chocolate heart bowls. Garnish with fresh raspberries and heart sprinkles if desired. Get instructions for working with pure chocolate and/or confectionery coating on my Chocolate Making Tips page. Be sure the entire heart shaped cavity is coated with chocolate and that the bottom is not too thick. Remove excess chocolate that pools on the bottom while it’s still warm and melted. It’s best to give each chocolate heart bowl a second coat of chocolate so that the side walls are thick enough that they won’t break once un-molded. Whip 1 cup of heavy whipping cream using a whisk, a hand-held mixer, or a stand mixer to get 2 cups of whipped cream. Your mousse will stay fresh for up to 5 days in the refrigerator. It’s best to fill your chocolate cups just before serving. It’s also best to allow the chocolate mousse to sit at room temperature for about 15 minutes before serving. This will help to intensify the chocolate flavor. Enjoy making these Chocolate Mousse Cup Hearts for Valentine’s Day. 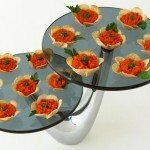 They’d also make great desserts for a wedding shower, Mother’s Day or a birthday. 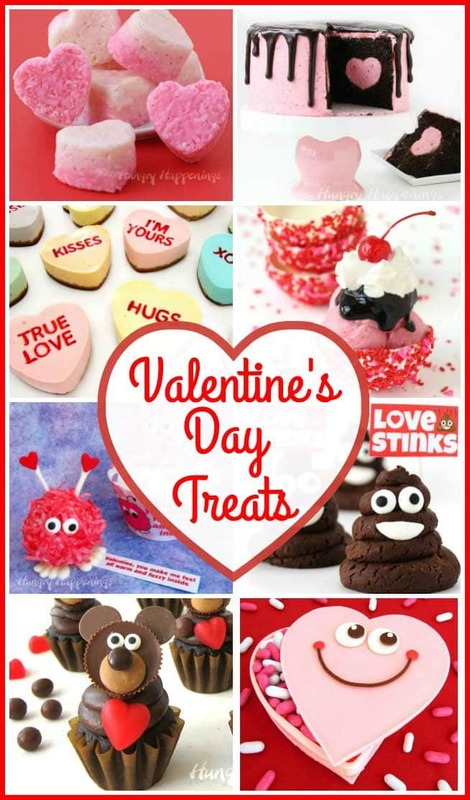 Before you go, be sure to check out all my other amazing Valentine’s Day recipes. It’s almost one month till Valentine’s Day and I found what I need for the day. Thank you for this beautiful recipe!! Bookmarked it and I will definitely try it! LOL! Be careful and have fun. Oh my, how I wish I had a little cup of this chocolate mousse right now. It’s what my heart wants! 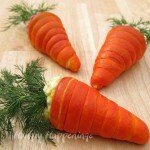 Please post a picture of recipes with the emails that you send.